There were all sorts of surprises for the retail sector in 2015, and more are likely ahead in 2016. Editors' Pick: Originally published Dec. 30. It was an eventful 2015 for the retail sector, and another year full of twists and turns may well be on tap for 2016. The year started with a bang in January as Target (TGT - Get Report) announced that it would shutter all 133 of its money-losing stores in Canada. Target's shares went onto rally 12% from January to a 52-week high on June 23, although they have since fallen about 13%. Meantime, Target's arch nemesis Walmart (WMT - Get Report) took the wraps off a new plan to invest over $1 billion in its people this year through higher hourly wages and re-training. While the move will help burnish Walmart's reputation and attract better workers, the investments in people, as well as additional plans to spend billions on upgrading the company's e-commerce operations and freshen up its stores, have pressured profits and the stock price. Walmart's shares have lost roughly 30% in 2015, while profits for the nine months ended Oct. 31 have dropped 11.4%. As Target was waving goodbye to Canadians and Walmart was saying hello to depressed profits, office supplies retailer Staples (SPLS spent 2015 begging regulators to approve its bid for smaller competitor Office Depot (ODP - Get Report) . Staples will begin 2016 still trying to gain the blessing of regulators on a transaction designed to create a company that is more competitive with Amazon (AMZN - Get Report) . With 2015 about to be a distant memory, TheStreet makes three predictions for the retail sector in 2016. 1. 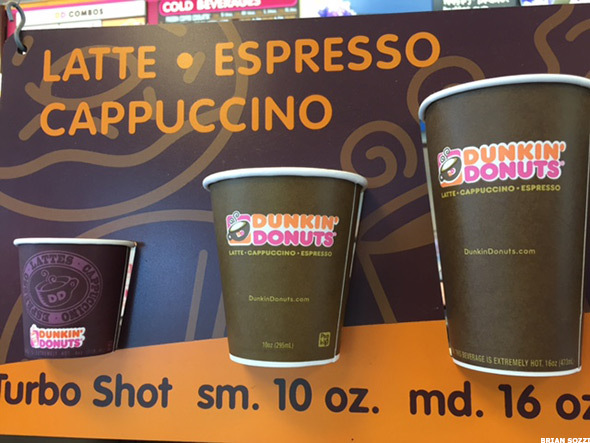 Dunkin' Brands brews up a key acquisition. Tea is the most widely consumed beverage in the world next to water, and can be found in almost 80% of all U.S. households. According to the Tea Association of the USA, approximately four in five U.S. consumers drink tea, with millennials being the most likely candidates. Over the last ten years, says the Tea Association of the USA, the ready-to-drink tea market in the U.S. has grown more than 15 fold to $5.2 billion. Given the solid existing market for tea in the U.S., which is likely to grow nicely in the future as more people gain awareness of its health properties, it may be time for coffee giant Dunkin' Brands to dip its toes in the water so to speak. Doing so via an acquisition would also alleviate pressure on Dunkin' Brands core coffee business, which is feeling increasing price competition from McDonald's (MCD - Get Report) for drip and specialty coffees, and pods for Keurig machines from various suppliers. A logical acquisition for Dunkin' Brands would be David's Tea (DTEA - Get Report) , which went public on June 5, 2015. Since its IPO, shares have plunged about 52% due to a broader sell-off in new restaurant issues, opening the door for Dunkin' Brands to make an opportunistic bid. David's Tea would give Dunkin' Brands access to the growing, premium loose leaf tea market, which the coffee titan could exploit in several ways. The first would be pitching the David's Tea concept to its existing, and experienced, franchisees to have them aggressively open stores in the U.S. -- currently, David's Tea only operates 130 or so stores in Canada and 24 in the U.S. With an average size of 850 square feet and operating margins over 15%, the store could be a lucrative opportunity for an existing Dunkin' Donuts franchisee. Another opportunity would be to bring David's Tea in ready-to-drink form to supermarkets in the U.S., where Dunkin' Brands already has relationships to distribute Keurig pods and bagged coffee. The company could also start selling certain popular David's Tea flavors in Dunkin' Donuts locations to help differentiate itself from McDonald's and Restaurant Brands' (QSR - Get Report) Tim Horton's concept, and better compete with Starbucks' (SBUX - Get Report) Teavana brand. And finally, there may even be an opportunity to sell tea-flavored David's Tea ice cream at Baskin Robbins, which Dunkin' Brands also owns. Dunkin' Brands would be following in the footsteps of Starbucks in buying a tea brand such as David's Tea. In Nov. 2012, Starbucks acquired loose leaf tea purveyor Teavana for $620 million. Since then, it has begun to sell Teavana brand tea drinks in Starbucks stores (most notably in concert with Oprah Winfrey), while opening new tea bars that serve handcrafted tea beverages. 2. 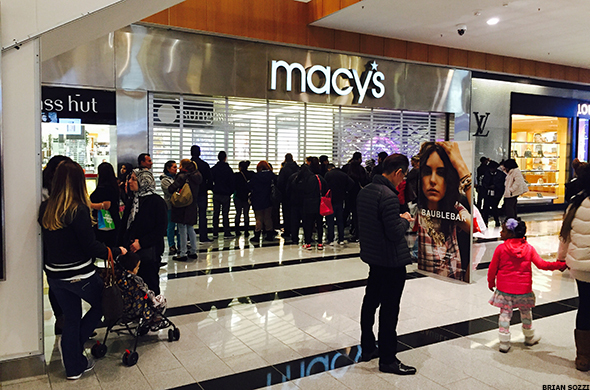 Ross Stores buys Macy's. The idea of off-price retailer Ross Stores (ROST - Get Report) buying Macy's (M - Get Report) , which boasts numerous high-end locations in major U.S. cities under the Macy's and Bloomingdales banners, would have once seemed unthinkable. But following a challenging year for Macy's that has sent its stock spiraling down by 46%, and a solid year for Ross Stores that has propelled its stock up 16%, Ross Stores has a bigger market cap ($22.7 billion ) than Macy's ($11.3 billion). The total enterprise value, which includes debt, of Ross Stores is $22.4 billion compared to Macy's at $18.7 billion. Given the current valuation disparity, Ross Stores has a powerful currency to barter with Macy's execs in consummating a transaction. Also, Ross Stores has a virtually debt-free balance sheet (16.4% debt to equity ratio), which should help it to fund a major acquisition such as this. Such a combination has benefits for both parties. Macy's was late in entering the lucrative off-price retail business, only opening the first of six new Backstage off-price locations planned for 2015 in September. Rather than moving forward with a costly build-out of an entirely new store network to help it clear unsold merchandise from its Macy's and Bloomingdales locations, Macy's could gain instant access to over 1,200 Ross Stores in 34 states. For Ross Stores, the company could become the exclusive off-price retailer for unsold Macy's merchandise, giving it access to some best-in-class inventory that would aid efforts to wrestle market share from off-price heavyweight TJ Maxx (TJX - Get Report) and its Marshall's division. That would be on top of Ross Stores benefiting directly from the sales and profits at over 750 Macy's stores and 37 Bloomingdales locations. Further, given the two very different business models of the two companies, a deal would likely gain swift approval by regulators, unlike the costly affair playing out now at Staples as it tries to buy Office Depot. Yoga apparel maker Lululemon (LULU - Get Report) has had a challenging year, highlighted by frequent fashion misses leading to unplanned, profit-busting markdowns. As a result, shares of Lululemon have fallen about 6% in 2015, lagging the S&P 500's gain of 0.6%, dealing a blow to CEO Laurent Potdevin, who gained plaudits on Wall Street for stabilizing the business upon arriving in 2014 after a major pant manufacturing issue. With the stock under pressure and product execution issues continuing, it may be time for Lululemon to admit that it needs a more experienced partner to restore the brand and make it truly global. The most likely suitor is V.F. Corp. (VFC , a notorious acquirer of brands. V.F. Corp. completed its $2 billion acquisition of boot and apparel maker Timberland in September 2011, and has since completely rebooted the brand once known mainly for its boots worn by hip-hop stars by expanding into new footwear styles and improving overall product quality. Improved styles and enhanced product quality are some of the things Lululemon needs to fuel stronger sales and profits. 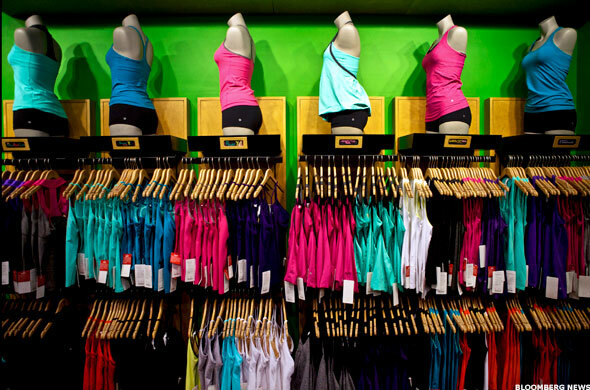 The Lululemon brand may also be helped longer term by gaining access to V.F. Corp's three new innovation centers that opened this year, all staffed by people tasked with finding the next big idea in apparel. "We're very active on the M&A front, that we can tell you for sure," said now former V.F. Corp. senior vice president and CFO Robert Shearer in a 2014 interview with TheStreet. He added, "even though we haven't had a lot to show for it since Timberland, that was a particularly big one, we have been very active on the looking part." Execs at V.F. Corp. have tole TheStreet on several occasions in 2015 that acquisitions remain a focus. V.F. Corp. may want to take a harder look at Lululemon as soon as the calendar turns.